October 28, 2008 By Bruce Kieffer & filed under Portable Power Tools, Portable Power Tools Safety, Router, Woodworking Safety. 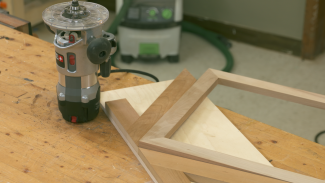 Whether you’re a seasoned woodworker, or just starting out, these router safety tips will help you work safer in your shop. 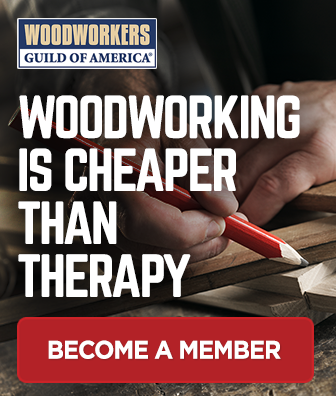 I’ve been a woodworker for 30 years, and trust me… I’ve made every mistake told here at least once. Fortunately, other than bruised pride and wasting some wood, I haven’t been hurt. Keep yourself as safe as you can in your shop. 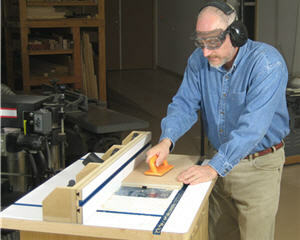 Judiciously use your machine guards and use hold-downs and hold-ins whenever possible. Here are some rules to follow, and some things to avoid when using your router. 1. Unplug the Tool. Make sure your router is unplugged before you insert bits, make height adjustments, or do any other setup type procedure. 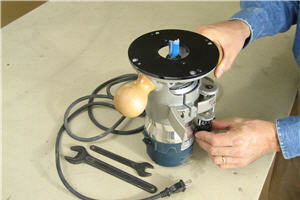 This is a good habit to get into with all your power tools and machinery. 2. Wear Hearing Protection. Routers are notorious “screamers.” Even so, I still see some friends using their routers but not wearing hearing protection. The cumulative effects of loud noise will eventually take its toll on your hearing. Purchase high decibel reduction hearing protection and use it always. 3. Push Pad for Better Gripping. 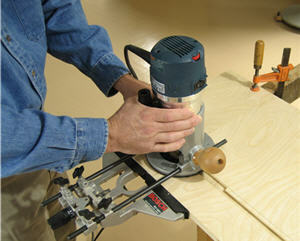 Use a push pad when routing grooves using a router table. 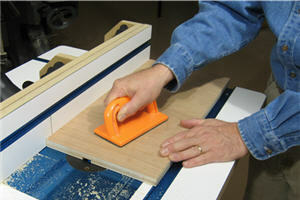 The push pad gives you a positive grip for pushing the work piece down and across the bit. It also helps keep your pushing hand further away from the area where the bit will exit the work piece at the end of the cut. 4. Big Bit, Slow Speed. The rule of thumb is: The larger the bit diameter, the slower the router speed. See the speed chart below. Make it a habit to adjust your router’s speed down before you insert the bit. That way it will not be going too fast by accident when you turn on the router. 5. Position the Fence Correctly. Never trap your material between the bit and fence on profile cuts. 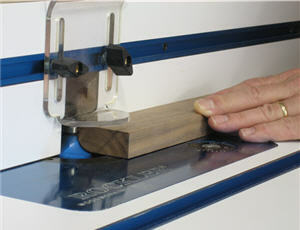 The set up shown is the correct method for routing an edge profile on a router table; with the bit inside the fence. The only time it’s OK to use the fence with a bit away from the fence is when you rout a groove of some sort. Even then, when the bit exits the work piece at the end of the cut, it will grab slightly and push the work piece forward. 6. Two Pass Grooves. When routing a groove with a setup like this where two passes are required to finish the groove width, the second pass is always made so that cut is further from the edge guide fence. That way, the edge guide will be pulled tight to the work piece edge by the forces of the routing, instead of pushed away. I am a new member and I have a question can I ask something and not be made fun of? Hi, Wade. Welcome to the WWGOA Team! Ask away! These guys are pros not trolls! If you think a question is stupid or you’re going to be made fun of, look at the fingers the guy has left who’s laughing because he already knew everything and was too proud to seem foolish. No question except the one not asked is stupid. We all learn from one another and from experts. Hi Stanley. Yes, that would make a good tip #7. These are particular useful when routing on smaller pieces, as the fulcrum of the pin provides better control over the work piece. Thank you so much for these unexpected information pages as well as the video’s./George. Hi Gina. You should be able to access the images now. Let us know if you are still having problems. Hi Garret. You should now be able to view these images. We are sorry for any inconvenience. What do you do for bit speed when your router doesn’t have a speed adjustment? Hi Mike. 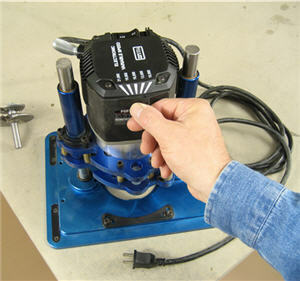 Depending on the make and model of your router, it might be possible to use a router speed control device like this one: http://www.rockler.com/router-speed-control. Check with the manufacturer for compatibility. Not all routers are supported. In particular, routers with a soft start feature are not supported. We apologize that you were not able to access the chart. The chart is also within the article further down the page. just started wood working, need some tips an info. I have on of those external router speed controllers, and it works really well. The only issue I have with it is that it’s impossible to know the rpm’s of the router at any given speed controller setting. The speed controller just has a dial, and as it’s turned clockwise the router speeds up, but there’s no way to know the rpm’s exactly. The router just spins faster or slower, that’s it. Hi Alain. Those indicate a percentage of the total speed. For larger bits you need to slow down. Here’s a video and a speed chart that can help you understand how fast to go with a particular bit. 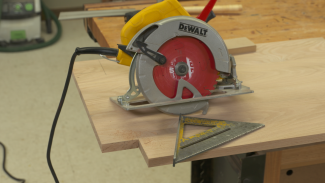 How to Set the Router Bit Speed Based on the Router Bit’s Diameter. I’m new using router. 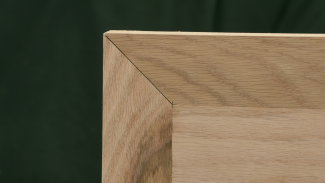 Q: my router bit is constantly coming out of place, what am I doing wrong? Hi Alejandro. This is a very unsafe situation and I would suggest replacing the collet. Hi William. I would suggest using the 3″ value for sizes from 2.5″ to 3″, or a prorated speed between the speeds recommended for 2″ and 3″. Than you for the information. Here are so man things that I Ned to know as I was never trained in woodworking. I think you should be wearing short sleeve shirt, don’t like the way sleeve is hanging down off the end of the work piece! NB Ticket 22277 Is there any problem running smaller bits at a slower speed. Can you run all bits T 12000. If I do what problems will I face? Your cut quality will probably not be as good as when you run at a faster speed. We’d love to have you be a part of our community. We are convinced you will enjoy the benefits of becoming a member and having access to the best instructional how to videos and professional tips. We would like to offer you a special promotion for your first-year membership. Thank you for your help! Your advice is very important! Really good tips on the safety.